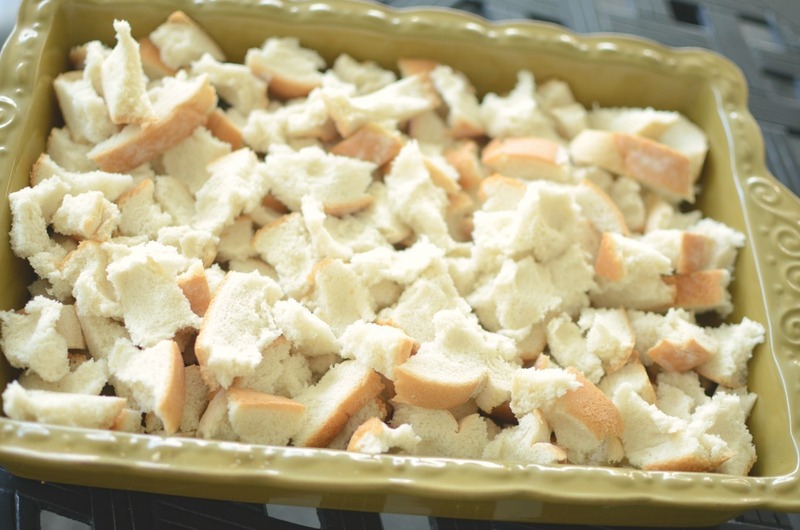 If you could smell my house right now, you would be thanking Sara Lee® Artesano™ Bread for sponsoring this French Toast Casserole recipe post. Seriously, computers need to come with a scratch and sniff add on for us foodies, because the aroma is truly heavenly. 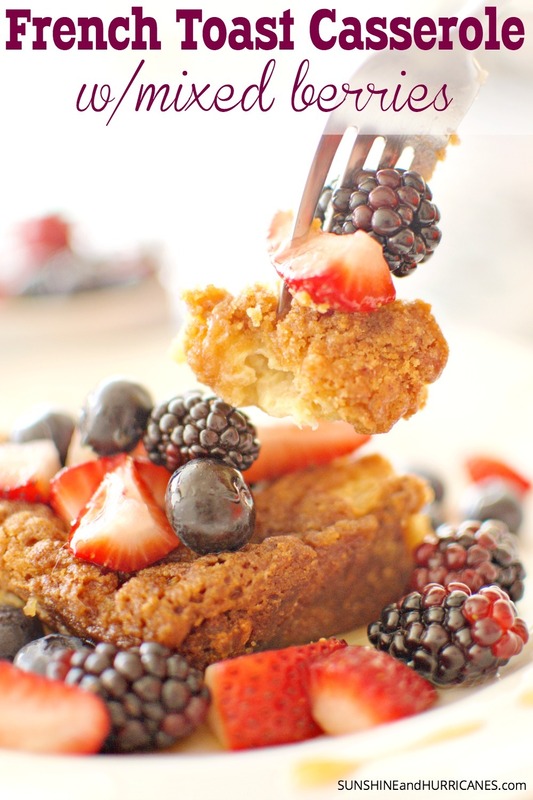 Guests will absolutely swoon over not only how good this french toast casserole smells, but also how amazing it tastes. It’s perfect for a family breakfast or a brunch. I’ve even used it at a book club meeting and served it with mimosas. Easy to make and it doesn’t have to be refrigerated overnight, which is ideal for a last minute gal like myself. I’ve made a french toast casserole similar to this one in the past, but I’ve usually used bakery bread and had it sit overnight. 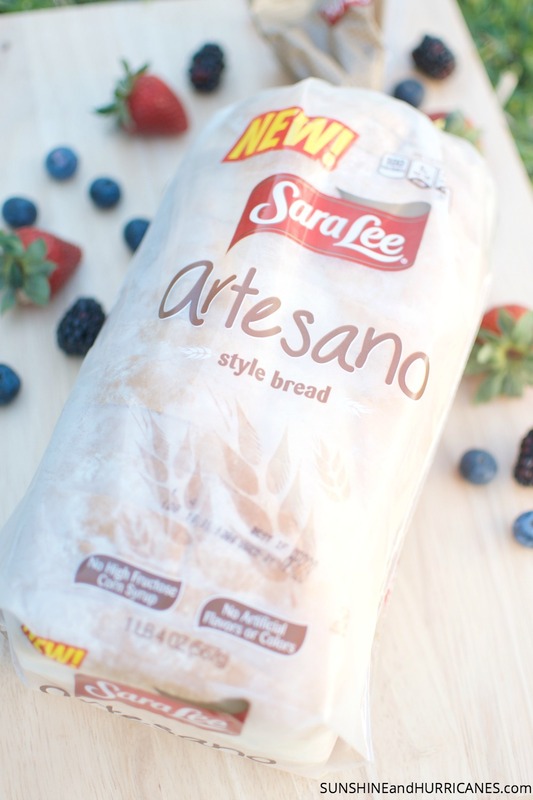 Now, with this new Sara Lee® Artesano™ Bread, I get the quality of Italian style bakery bread (no artificial ingredients and all that jazz), but it’s so light and has such a creamy flavor, I don’t need it to soften up overnight to get that just right consistency and taste. Grab a 9×13 baking pan and butter the bottom lightly. 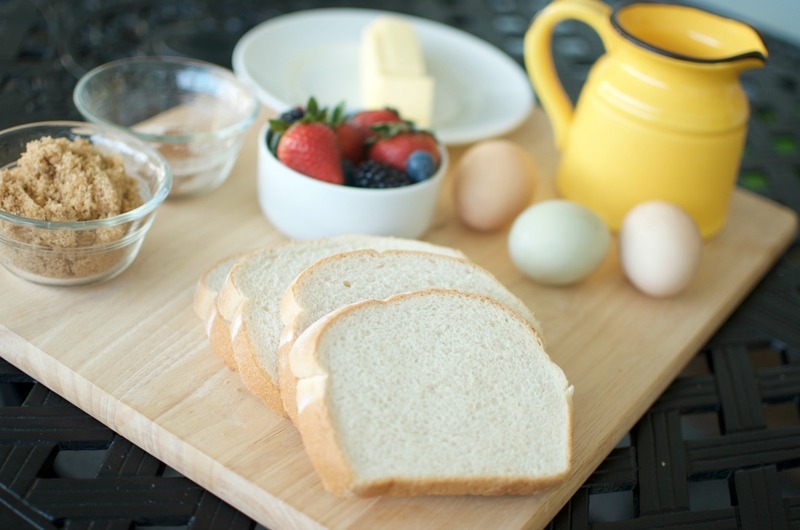 Tear the pieces of the Sara Lee® Artesano™ Bread into small pieces and place in the pan. 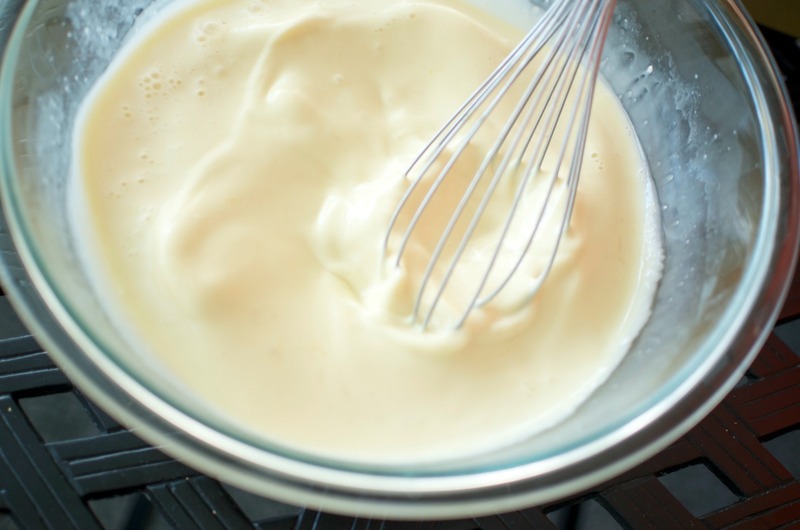 Next whisk together the eggs, milk, cream, white sugar and vanilla in a bowl and pour over the bread pieces. Don’t forget the vanilla (I even add a little extra), it’s part of what makes this french toast casserole so tasty! 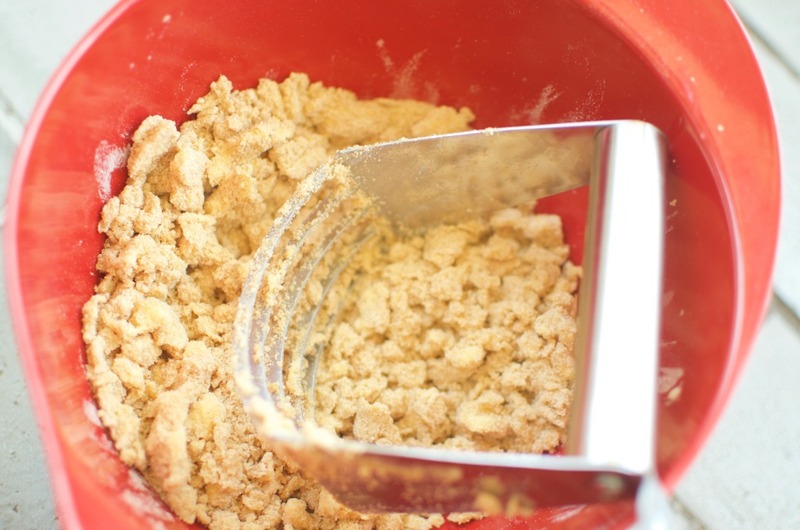 In another bowl, mix together the brown sugar, flour and cinnamon then add the butter and mix with either a pastry blender or a two knives so you get a crumbly dough. Sprinkle the crumbles evenly over the top of the bread mixture. Place in the oven and bake for one hour. While the casserole is baking, you can cut up your berries and then I often like to add a splash of vanilla and a tsp of sugar into the bowl with them. Mix it up and stick back in the fridge to chill. When the casserole is done baking, remove from the oven and let sit for five minutes just to cool a touch. Slice and serve onto individual plates and top with the berry mixture as well as syrup. Yes, I love the syrup too even though it’s plenty sweet without it. If I’m in, I’m going all in! Be prepared, if you serve this french toast casserole to guests, they are going to want the recipe. It’s one of my MOST requested breakfast recipes. To. Die. For. Definitely make sure you tip them off to using Sara Lee® Artesano™ Bread. That’s really key to skipping the overnight step. It’s actually on special at Wal-Mart right now, so stock up. It’s great for more than just french toast, and can be used for all your sandwich needs (ridiculously good for grilled cheese sandwiches). 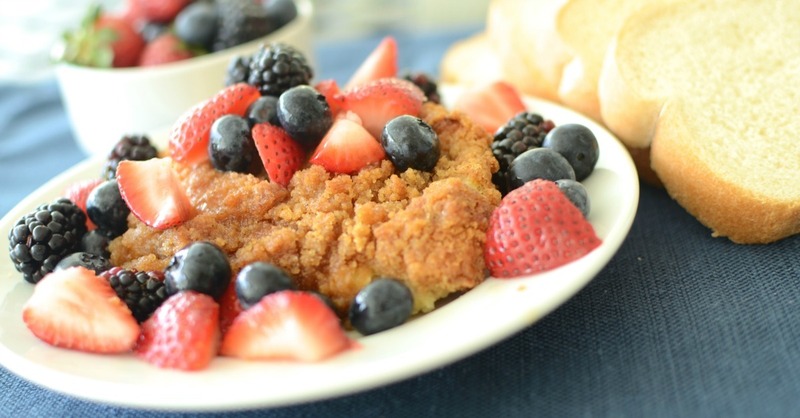 So, what toppings would you put on this french toast casserole? One last thank you to Sara Lee® Artesano™ Bread for sponsoring this post for my favorite french toast casserole (and for making my house smell so good!) . I have always loved French toast, but I’ve never tried it in a form of casserole. 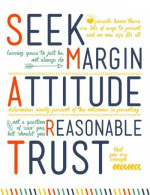 I must, though! That looks amazing. I keep seeing this bread at the stores but had no idea what the difference was. I am going to try this! This looks amazing. I’ve never tried making sourdough bread, but these easy steps are tempting. Oh my goodness, this looks soo good! I’m a purist, I’d probably stick with some maple syrup, but I bet with the fruit, honey would be really good. Omg this casserole looks so yummy!!!! I am definitely going to have to make this! This is going to be a great addition to the Mothers Day brunch we are having this year. French toast is a huge favorite. This sounds absolutely amazing! I am adding it to next week’s menu. My kids are going to love it! I’ve always wondered what would be the perfect type of bread for french toast–thanks for telling me! This recipe looks amazing too by the way. What a creative take on French Toast. We’re having a brunch party on Sunday and we feel like this dish needs to make an appearance. This looks like a great recipe! I love that you can put it together and then pop it into the oven. A great way to serve a lot of people French toast all at once. I have seen a french toast casserole a few times and have always wanted to make one! this looks so delicious and I bet your home smells so good whilst it is baking! That looks delicious. I love french toast with berries, but couldnt even tell you the last time I had any. Carbs are my weakness. I have been wanting to make a french toast casserole and love that this recipe doesn’t have to be made the night before. I love how crumbly the topping is. Well this looks absolutely amazing! I think I need to make this for my family this weekend! This looks very good. I hadn’t heard of this bread before, so I will be sure to look for it. I have pinned it for future reference! I love-love-love French toast but havent made it in forever. Why? Its so yummy! This recipe with the berries looks amazing! Oh my gosh that looks super yummy!! I can’t wait to try this one out on my family this weekend! We make something similar with cream cheese and blueberries. It is delicious! This looks yummy too!